1) Hype can be a terrible thing indeed. It can so easily ruin the experience of something. It’s why, when I was a newspaper movie reviewer (yes, it is the best job ever. Until you have to see a bad movie) I preferred not to read other reviews of a movie I was about to see. Nor did I want to read stories about the making of the movie. In fact, the less I knew about the movie – including the basic plot – the better. 2) Walking into a movie I knew nothing about greatly increased the chance I’d like it. I had no expectations of what was supposed to happen or where the film was supposed to go, so I could let it unfold itself at its own pace. Reading about the film would create expectations in my mind, which the film may not reach. 3) It’s the same for a lot of things – including beer. 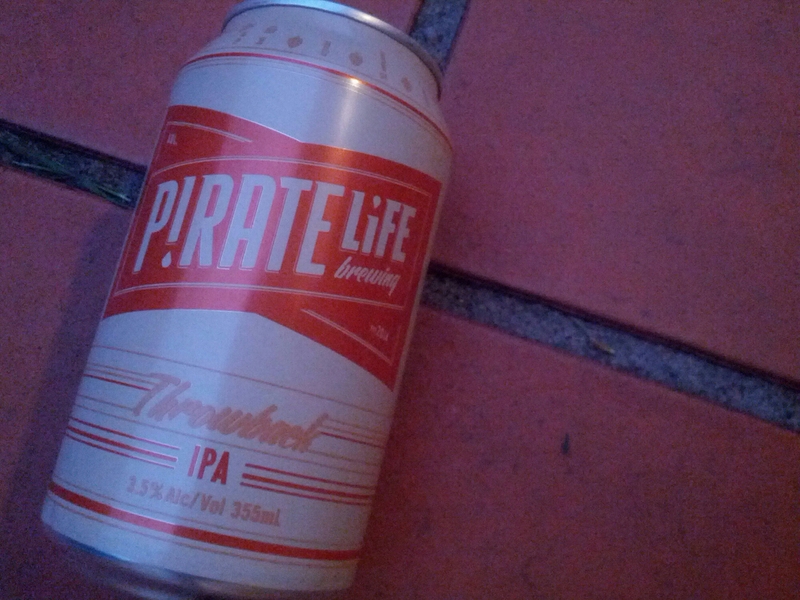 In this instance, it’s the Pirate Life Throwback IPA. The beer has had a staggered release around the country, which I assume is due to the small size of the brewery. So by the time it made its way to NSW and I managed to get my hands on some, there was a tidal wave of hype surrounding both the brewery and this beer. Seemed like every time I checked a beer website or flicked through Twitter someone was banging on about its general awesomeness. And so I had expectations raised – substantially. 4) Is that the beer’s fault? Hell no – it’s my fault. Totally my fault. The brewery didn’t create the hype -everyone else did. Nor did the brewery make me listen to that hype and raise my expectations accordingly. Nope, that’s all on me. But the problem with raising expectations is that it’s harder to be surprised by the beer, because I’ve already decided what to expect. 5) But still, I really wish I could have tried this beer having not heard anything about it. Because I’m sure I would have liked it more. Yes, it contains a surprising level of flavour and bitterness for a 3.5 per cent beer, but I already knew that. Yes, it is tasty. But I already knew that too. What happened is the beer lived up to my expectations. Which means that was what the beer was SUPPOSED to taste like, right? At least in my head. To make me go ‘‘wow!’’ it’s like the beer would have had to surpass my already high expectations, which an unfair ask on my part. Don’t get me wrong, it’s a very good beer and I’m glad I bought a six-pack of it rather than a single can. But I wish I had let myself be surprised by this beer, through knowing nothing about it. Guess that means I have to stop using Twitter.